Planning an International Move? The 5 Best European Cities to Live In. July 27th, 2015 | Moving Tips. Imagine if you lived in the same house, the same neighborhood, and the same city for your entire life. How much culture would you have exposure to? Sure, you might learn new things about people all over the world thanks to your television set, but you’ll never get to taste those foods, walk up those staircases, and see that art in person. Luckily, you have no intention of living in the same house or even the same city. You have wanderlust, and you’d like a change of scenery. So you’ve decided to move to Europe – you just don’t know where yet. Let us help you out. We’ve compiled some European cities that have routinely ranked high on Mercer Consulting’s Worldwide Quality of Living Survey, which they publish every year. Have a look at these cities as you decide where to live and when you are ready to move, let us help you with our international moving services. If you want to inundate yourself with so much artistic, musical, historical, and culinary culture that you can’t stand it, move to Vienna. The United Nations has designated this city’s center as an educational, scientific, and cultural World Heritage Site. No matter what your passion is, you can find more than enough to satisfy it in this city. 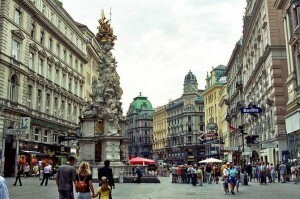 Additionally, Vienna boasts one of the world’s top education systems, and you’ll have a hard time finding anything but top-notch housing. Keep in mind, however, that you will have to learn German if you don’t know it already. Zurich may have a smaller population than other cities on its list, but despite its small size, it has more than enough adventure to fill a lifetime. It boasts thousands of restaurants, including one with original paintings by Cezanne and Picasso. It also gives residents a gorgeous view of the Swiss Alps and Lake Zurich. Beyond that, Zurich also boasts low taxes – the lowest in Switzerland – not to mention a nonexistent inheritance tax. It also has top scores for medical care and banking services. Just remember that you will have to learn German, French, or Italian to get by in this country – you’ll do best with German or French. When you move to Dusseldorf, you move to the fashion and shopping capital of Germany. You’ll have so much to see and do. Plus, you’ll live in a beautiful area on the banks of the Rhine River. You won’t have any trouble getting a job here because it features advanced infrastructure and international transport connections, not to mention some of Germany’s largest corporations. Again, before you decide to move to Dusseldorf, you will have to learn German. Many people do speak English, but you show your respect for residents and their culture when you learn German. Copenhagen has a high cost of living, but that doesn’t mean you would hate your life if you lived there. It boasts over 11 Michelin – starred restaurants, not to mention hundreds of art galleries and museums. You’ll also stay healthier if you live here. The city features a popular bike culture, as well as a relatively clean environment compared to most big cities. Additionally, Copenhagen has plenty of international schools and fantastic medical facilities. Just make sure you know Danish before you go there. When you’ve seen Amsterdam in movies, you probably admired the miles of canals and green areas. Amsterdam also houses a number of art museums and other cultural attractions that will keep you entertained for years. And like Copenhagen, this city has many international schools so your children won’t face a disadvantage if they move here. However, Amsterdam has higher pollution and limited housing, so take that into account before moving to this country. And don’t forget to learn Dutch! If you move to a new country, all sorts of exciting opportunities will open up for you. Consider all the cities above as you plan your next international move.